David showed me a story earlier today, and I can’t stop thinking about it. [David showed it to me here, on Futility Closet, where you can read the whole story much more concisely and coherently.] It concerns Michel Navratil, the last survivor of the Titanic. He and his brother, who were 2 and 3 years of age at the time, survived the crash, but had no adult to claim them after, and spoke no English, so they came to be known as “the titanic orphans.” A woman who had been in their lifeboat looked after them until the true story could be discovered. As it happens, they were the children of a French tailor who had taken them from his estranged wife, and planned to escape to America with them. He’d taken them to Monte Carlo, and then to England, and they’d boarded the Titanic under assumed names. As the ship was sinking, their father “…dressed me very warmly and took me in his arms, A stranger did the same for my brother. When I think of it now, I am very moved. They knew they were going to die.” Michel’s voice is so sweet and thoughtful, and his memories are so unexpected, yet so perfect for a child. You can’t help but fill in the story, you can’t help but wonder if the brothers were friends, as my boys are. Did they travel with their arms around each other, as my boys do? They’d already had such adventures by the time they reached the Titanic; were they scared? Were they angry at their father? Did they know where they were going? What would their life have been like if the ship had never crashed? Michel does not remember being scared. He enjoyed his time on the Titanic, he found it “A magnificent ship!…I remember looking down the length of the hull – the ship looked splendid. My brother and I played on the forward deck and were thrilled to be there. One morning, my father, my brother, and I were eating eggs in the second-class dining room. The sea was stunning. My feeling was one of total and utter well-being.” And even after they struck the iceberg, he wasn’t frightened, “I don’t recall being afraid, I remember the pleasure, really, of going plop! into the life-boat. We ended up next to the daughter of an American banker who managed to save her dog–no one objected. There were vast differences of people’s wealth on the ship, and I realized later that if we hadn’t been in second-class, we’d have died. The people who came out alive often cheated and were aggressive, the honest didn’t stand a chance.” Michel and his brother were eventually discovered by their mother and taken back to France (on a boat!) His brother died aged 43 in 1953. Michel became a professor of philosophy, and he lived to be 92 years old. But he says, “I died at 4. Since then I have been a fare-dodger of life. A gleaner of time.” A gleaner of time. Good grief. I call this a cake, but you could make it in a square pan and cut it into bars and call it bar cookies. It’s dense and delicious. It has dried cherries, toasted hazelnuts, oats, and chocolate. It’s plain in many ways, but it’s also complicated and delicious. David and I joked that it was like trail mix bars, but trail mix bars with plenty of butter and sugar in them!! Preheat the oven to 375 and butter and flour a cake pan. In a food processor, process the eggs until light and fluffy. Add the brown sugar, rum and vanilla, and keep processing until lighter and fluffier. Add the cherries, hazelnuts and oats, and process until they’re fairly well broken down. The batter will never be completely smooth, and you don’t want it to be! and the flour and salt and process to combine. Add the chocolate chips, and process until some of them are broken down, but some are still fairly whole. Pour the batter in the prepared pan and bake for 20 – 25 minutes, until it’s golden and pulling away from the pan, and it springs back up if you press on it lightly. 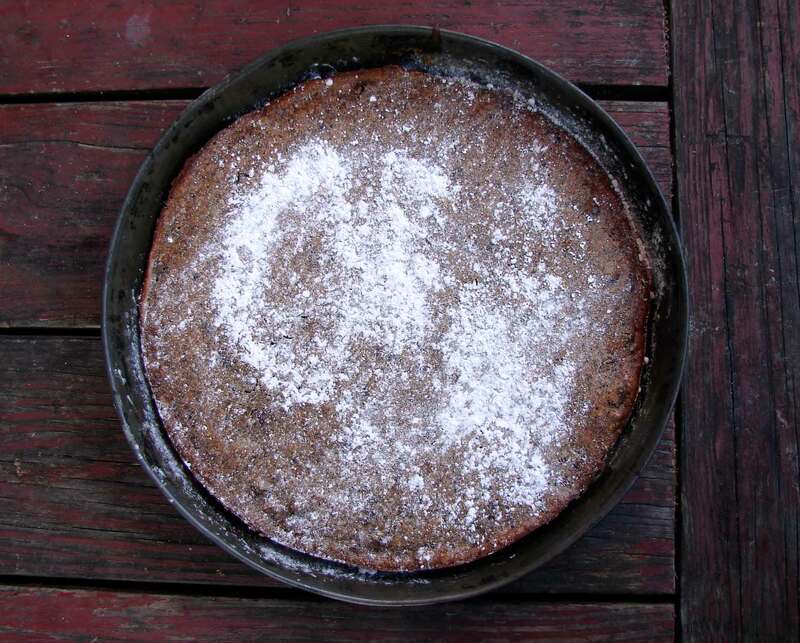 This entry was posted in cake, chocolate, dessert, recipe and tagged chocolate cherry, dense cake, dried cherry cake, hazelnut, trail mix cake by Claire. Bookmark the permalink. This is very, very naughty! So I’ll have to give it a go.